Even though users have the permission to install Unfriend Watch from its official site, our researchers have found that the application published by Fresh Applications is often distributed by third parties. Do you know why this is considered to be dangerous? Well, unfamiliar software distributors could bundle this advertisement-supported program with other threats. If that happens, Unfriend Watch Ads will no longer be your only problem. If you are worried that you might need to delete adware-related infections, but you are not sure which ones, you can always install a malware scanner. SpyHunter offers a free malware scanner that you can download from this page. 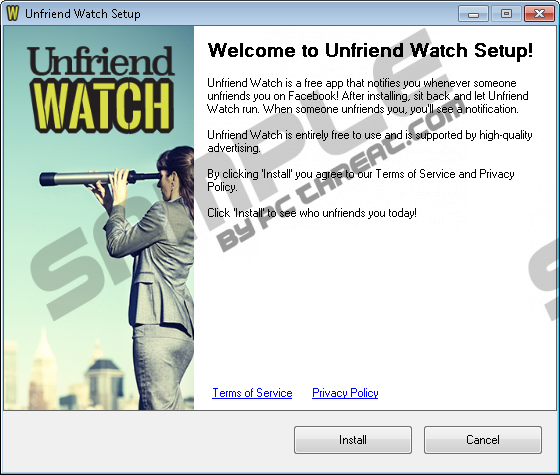 Even though most users do not need proof that they need to delete Unfriend Watch Ads, this tool will certainly inform you about this adware as well. Are you surprised to encounter Unfriend Watch Ads? If you are, you must not know that this program is supported by advertising and can inject “pop up ads, pop under ads, or other types of ads.” This is disclosed in the EULA, which further proves that users MUST research the software they choose to install. If you simply click the buttons to confirm the installation, sooner or later you will install truly malicious threats, and your virtual security will be at serious risk. Even though Unfriend Watch Ads are unpredictable, you should evade all security risks if you use your head. According to our researchers, it is best to remove Unfriend Watch Ads because they could show unreliable offers that could expose you to unreliable sites and products. Do you want to delete Unfriend Watch Ads from your browsers? If you do, you have to tackle UnfriendWatch. This is the name of the installer that you need to uninstall in order to eliminate unreliable ads. In some cases, you might have to terminate the process called “UnfriendWatch.exe*32” first. Right-click the Taskbar, select Start Task Manager, and click the Processes tab to find this process. As soon as you terminate this process, you should have no trouble deleting Unfriend Watch Ads. If you are looking for a different way to get rid of these ads, we suggest using an automated malware remover. This tool will not only delete adware but will also identify and remove other infections that could have been infiltrated onto your PC. Click Start on the Taskbar and move to Control Panel. Click the suspicious application and select Remove. Access the Charm bar in Metro UI and click Search. Enter Uninstall a program to find the utility and launch it. Quick & tested solution for Unfriend Watch Ads removal.